98.0% per day in mid-November 2008 or 8.97×1022% per year. The currency lost half its value every 24 hours and 42 minutes. The Zimbabwean dollar was introduced in 1980 to directly replace the Rhodesian dollar (which had been introduced in 1970) at par (1:1), at a similar value to the US dollar. Over time, hyperinflation in Zimbabwe reduced the Zimbabwe dollar to one of the lowest valued currency units in the world. It was redenominated three times (in 2006, 2008 and 2009), with denominations up to a $100 trillion banknote issued. The final redenomination produced the "fourth dollar" (ZWL), which was worth 1025 ZWD (first dollars). The Zimbabwean dollar's predecessor, the Rhodesian dollar, was essentially equal to half of the value of the pound sterling at the time of its adoption (during the decimalisation of 1970). The same practice which was used in other Commonwealth countries such as South Africa, Australia, and New Zealand. The selection of the name was motivated by the fact that the reduced value of the new unit correlated more closely to the value of the US dollar than to the pound sterling. The main illustration on the obverse of all of the banknotes was the Chiremba Balancing Rocks in Epworth, Harare, which were used as a metaphor demonstrating the importance of balancing development and the preservation of the fragile environment. The reverse side of dollar notes often illustrated the culture or landmarks of Zimbabwe. The first Zimbabwean dollar was introduced in 1980 and replaced the Rhodesian dollar at par. The initial ISO 4217 code was ZWD. At the time of its introduction, the Zimbabwean dollar was worth more than the US dollar in the official exchange market, with 1 ZWD = 1.47 USD, although this did not reflect the actual purchasing power it held. As a result, in both the official and parallel markets, the currency's value eroded rapidly over the years, and by July 2006, the parallel market value of the Zimbabwean dollar fell to Z$1,000,000 = GB£1. In October 2005, the head of the Reserve Bank of Zimbabwe, Dr. Gideon Gono, announced that Zimbabwe would have a new currency the following year, and new banknotes and coins would be produced. However, in June 2006, it was decreed that, for a new currency to be viable, Zimbabwe had to first achieve macro-economic stability (i.e., double digit inflation). Instead, in August 2006, the first dollar was redenominated to the second dollar at the rate of 1000 first dollars to 1 second dollar (1000:1). At the same time, the currency was devalued against the US dollar, from 101000 first dollars (101 once revalued) to 250 second dollars, a decrease of about 60% (see exchange rate history table below). ISO originally assigned a new currency code of ZWN to this redenominated currency, but the Reserve Bank of Zimbabwe could not deal with a currency change, so the currency code remained 'ZWD'. The revaluation campaign, which Gideon Gono named "Operation Sunrise", was completed on 21 August 2006. It was estimated that some ten trillion old Zimbabwe dollars (22% of the money supply) were not redeemed during this period. The following year, on 2 February 2007, the RBZ revealed that a new (third) dollar would be released. However, with inflation still exceeding 1000%, the banknotes were kept in storage. During the same month, the Reserve Bank of Zimbabwe declared inflation illegal, outlawing any raise in prices on certain commodities between 1 March and 30 June 2007. Officials arrested executives of some Zimbabwean companies for increasing prices on their products, and economists reported that "chaos had started to reign and people in the public sector has becoming frantic". On 6 September 2007, the Zimbabwe dollar was devalued again by 92%, creating an official exchange rate of ZW$30,000 to US$1, although the black market exchange rate was estimated to be ZW$600,000 to US$1. As an official exchange rate became more unreliable, the WM/Reuters company introduced a notional exchange rate (ISO ZWN) which was based on Purchasing Power Parity utilising the dual listing of companies on the Harare (ZH) and London Stock exchanges (LN). On 30 July 2008, the dollar was redenominated and given a new currency code of ZWR. After 1 August 2008, 10 billion ZWN were worth 1 ZWR. Coins valued at Z$5, Z$10 and Z$25 and banknotes worth Z$5, Z$10, Z$20, Z$100, and Z$500 were issued in ZWR. Due to frequent cash shortages and the apparently worthless Zimbabwean dollar, foreign currency was effectively legalised as a de facto currency on 13 September 2008 via a special program. This program officially allowed a number of retailers to accept foreign money. This reflected the reality of the dollarisation of the economy, with many shop keepers refusing to accept Zimbabwe dollars and requesting US dollars or South African rand instead. Despite redenomination, the RBZ was forced to print banknotes of ever higher values to keep up with surging inflation, with ten zeros reappearing by the end of 2008. On 2 February 2009, the RBZ announced that a further 12 zeros were to be taken off the currency, with 1,000,000,000,000 third Zimbabwe dollars being exchanged for 1 new fourth dollar. New banknotes were introduced with face values of Z$1, Z$5, Z$10, Z$20, Z$50, Z$100 and Z$500. The banknotes of the fourth dollar circulated alongside the third dollar, which remained legal tender until 30 June 2009. The new ISO currency code was ZWL. Despite the introduction of the fourth dollar, the problems were not eliminated, and the economy continued to be almost completely dollarised. In his first budget, the Zimbabwe finance minister, Tendai Biti, stated "the death of the Zimbabwe dollar is a reality we have to live with. Since October 2008 our national currency has become moribund". In late January 2009, acting Finance Minister Patrick Chinamasa announced that all Zimbabweans would be allowed to conduct business with any currency, as a response to the hyperinflation crisis. On 12 April 2009, media outlets reported that economic planning minister Elton Mangoma had announced the suspension of the local currency "for at least a year", effectively terminating the fourth dollar. All four issues of the Zimbabwean dollar experienced high rates of inflation, although it was not until the early 2000s that Zimbabwe started to experience totally unsustainable hyperinflation. On 13 July 2007, the Zimbabwean government said that it had temporarily stopped publishing (official) inflation figures, a move that observers said was meant to draw attention away from "runaway inflation which has come to symbolise the country's unprecedented economic meltdown". In 2008, the inflation rate accelerated dramatically, from a rate in January of over 100,000% to an estimated rate of over one million percent by May, and nearly 250,000,000% in July. As predicted by the quantity theory of money, this hyperinflation was linked to the Reserve Bank of Zimbabwe's choice to mushroom the money supply. The Reserve Bank of Zimbabwe responded to the dwindling value of the dollar by repeatedly arranging the printing of further banknotes, often at great expense from overseas suppliers. On 1 March 2008, it was reported that documents obtained by The Sunday Times showed that the Munich company Giesecke & Devrient (G&D) was receiving more than €500,000 (£381,562) a week for delivering bank notes equivalent to Z$170 trillion a week. By late 2008, inflation had risen so high that automated teller machines for one major bank gave a "data overflow error" and stopped customers' attempt to withdraw money with so many zeros. The use of foreign currencies was legalised in January 2009, causing general consumer prices to stabilise again after years of hyperinflation and price speculation. The move led to a sharp drop in the usage of the Zimbabwean dollar, as hyperinflation rendered even the highest denominations worthless. The Zimbabwean dollar was effectively abandoned as an official currency on 12 April 2009, when the Economic Planning Minister Elton Mangoma confirmed the suspension of the national currency for at least a year. On 29 January 2014, the Zimbabwe central bank announced that the US dollar, South African rand, Botswana pula, Pound sterling, Euro, Australian dollar, Chinese yuan (renminbi), Indian rupee, and Japanese yen would all be accepted as legal currency within the country. In June 2015, the Reserve Bank of Zimbabwe began to formally demonetise the Zimbabwean dollar, to officially value the fiat currency at zero, in order to complete a switch to the US dollar by the end of September 2015. 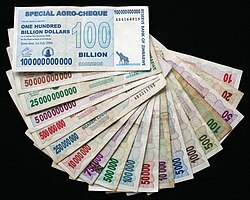 The Zimbabwean government stated that it would credit 5 US dollars to domestic bank accounts, with balances of up to 175 quadrillion Zimbabwean dollars, and that it would exchange Zimbabwean dollars for US dollars at a rate of 1 USD to 35 quadrillion Zimbabwean dollars to accounts with balances above 175 quadrillion Zimbabwean dollars. This move was meant to stabilise the economy and establish a credible nominal anchor under low inflation conditions. The exercise brought closure to the outstanding issue on the Zimbabwe dollar, further confirming the government's position that the local unit will not return anytime soon. The Government has maintained that the return of the Zimbabwe dollar will only be considered when key economic fundamentals, such as productivity in key sectors, have been achieved. In 1980, coins were introduced in denominations of 1, 5, 10, 20, 50 cents, and 1 dollar. The 1 cent coin was struck in bronze, with the others struck in cupro-nickel. In 1989, bronze-plated steel replaced bronze. A 2 dollar coin was introduced in 1997. In 2001, nickel-plated steel replaced cupro-nickel in the 10, 20 and 50 cents and 1 dollar coins, and a bimetallic 5 dollar coin was introduced. The Reserve Bank of Zimbabwe announced plans for new Z$5,000 and Z$10,000 coins in June 2005, although these were never actually struck. In its 2014 mid-term monetary policy statement, the Reserve Bank of Zimbabwe (RBZ) said it would import special coins, known as Zimbabwean bond coins, to ease a shortage of change in the economy. Like the original 1980 coins, these special coins would be denominated in 1, 5, 10, 20, and 50 cents, but would have values at par with US cents. There would also be South African rand coins of 10 cents, 20 cents, 50 cents, 1 rand, 2 rands, and 5 rands. The RBZ's statement did not specify when or where these coins would be imported from, but a later report on November 26, 2014 clarified that over $40 million worth of these coins were expected to be delivered within the next week from Pretoria. On 18 December 2014, the 1, 5, 10, and 25 US cent denominations were released into circulation. The 50 US cent denomination followed in March 2015. A 1 dollar bond coin was released in November 2016. The banknotes of the Zimbabwean dollar were issued by the Reserve Bank of Zimbabwe from 1980 to 2009. Up to 2003, regular banknotes were issued, but as hyperinflation developed from 2003, the Reserve Bank issued short-lived emergency traveller's cheques. 2002 55 380 (Jan) to 710 (Jun), 1400 (Jul) to 1740 (Oct) to 1400 (Dec) In 2002, the parallel black market for foreign exchange mushroomed. The second dollar started off on August 1, 2006 with an official rate of 250 and a parallel rate of 550 to the US$. In July 2008 the dollar was revalued again, this time 10,000,000,000 2nd dollars became 1 3rd dollar, after the parallel rate reached 500 billion to 1 US$. On 1 August 2008, ten zeroes were removed from the currency, reducing 10 billion Zimbabwean dollars to one dollar. On 3 October 2008, the Reserve Bank of Zimbabwe temporarily suspended the Real Time Gross Settlement (RTGS) system, halting electronic parallel market transfers, but it was reinstated on 13 November 2008. ["Zimbabwe's re-valued currency after one month"] includes a daily list of the ZWD parallel exchange rates in August 2008. ^ After the Zimbabwean dollar was suspended indefinitely from 12 April 2009, Euro, United States dollar, Pound sterling, South African rand, Botswana pula, Australian dollar, Chinese yuan, Indian rupee and Japanese yen are used as legal tender. The United States dollar has been adopted as the official currency for all government transactions. ^ "Current currency & funds code list (Table A.1)". Swiss Association for Standardization. 1 January 2015. Retrieved 15 January 2015. ^ Hanke, Steve H. (17 November 2008). "New Hyperinflation Index (HHIZ) Puts Zimbabwe Inflation at 89.7 sextillion percent". The Cato Institute. Retrieved 17 November 2008. ^ Hanke & Kwok (2009). "On the Measurement of Zimbabwe's Hyperinflation" (PDF). Cato. ^ "Zimbabwe rolls out Z$100tr note". BBC News Online. Retrieved 7 July 2014. ^ a b McGee, Patrick (12 June 2015). "Zimbabwe ditches its all but worthless currency". Financial Times. ^ Mandizha, Tarisai (9 February 2016). "Demonetisation: DPC settles closed banks Zim dollar accounts". NewsDay. Retrieved 8 March 2016. ^ Hungwe, Brian (6 February 2014). "Zimbabwe's multi-currency confusion". BBC News Online. Retrieved 5 September 2016. ^ "Zimbabwe to make Chinese yuan legal currency after Beijing cancels debts". The Guardian. Agence France-Presse. 22 December 2015. ^ Lopes, Carlos (February 1996). Balancing rocks: environment and development in Zimbabwe. Nordic Africa Institute. ISBN 978-9-17106-3-946. Retrieved 11 February 2011. ^ Gumbo, Joseph (27 July 2006). "Bills Put Zimbabwe Under "Martial Law"". Institute for War and Peace Reporting – via The Zimbabwe Situation. ^ "Currency reform Zimbabwe" (PDF). Telekurs Financial. 9 August 2006. Archived from the original (PDF) on 22 October 2007. ^ Ndlela, Dumisani (15 September 2006). "78% old currency returned: RBZ". Zimbabwe Independent – via The Zimbabwe Situation. ^ Wines, Michael (7 February 2007). "As Inflation Soars, Zimbabwe Economy Plunges". The New York Times. ^ "Zimbabwe jail over bread prices". BBC News. 1 December 2006. ^ a b Cross, Eddie (15 June 2007). "Ground Zero". The Zimbabwe Situation. ^ Wilson, David (7 September 2007). "S&P's Sub-$10 Club, Lexmark's Buy, Zimbabwe's Dollar: Timshel". Bloomberg. Archived from the original on 25 October 2012. Retrieved 16 September 2008. ^ Raath, Jan (7 September 2007). "Devaluation is 'too little, too late' to save Zimbabwe". Times Online. ^ Hanke, Steve H.; Kwok, Alex K. F. (Spring–Summer 2009). "On the Measurement of Zimbabwe's Hyperinflation" (PDF). The Cato Journal. ^ a b Shaw, Angus (30 July 2008). "Zimbabwe devalues currency; 10B becomes 1 dollar". USA Today. Associated Press. ^ Mafaro, Wayne (30 July 2008). "Mugabe says might declare state of emergency over prices". Zimbabwe Online. Archived from the original on 8 September 2008. Retrieved 30 July 2008. ^ Berger, Sebastien (10 September 2008). "Final humiliation for Zimbabwe dollar as foreign currency legalised". The Daily Telegraph. Retrieved 13 September 2008. ^ Thornycroft, Peta; Berger, Sebastien (26 October 2008). "Zimbabwe shops stop accepting local currency". The Daily Telegraph. Retrieved 27 October 2008. ^ Brulliard, Karin (4 December 2008). "Zimbabweans Turn to U.S. Dollar as Hyperinflation Erodes Value of Local Currency". The Washington Post. ^ a b c d "Zimbabwe removes 12 zeros from currency". CNN. Retrieved 7 January 2010. ^ "Zimbabwe dollar sheds 12 zeros". BBC News. 2 February 2009. Retrieved 2 February 2009. ^ "Zimbabwe dollar sheds 12 zeros". BBC News. 2 February 2009. Retrieved 7 January 2010. ^ "Zimbabwe removes 13 zeroes from currency". CNN. Harare, Zimbabwe. 2 February 2009. Retrieved 2 February 2009. ^ "WM Company". WM Company. 28 September 2009. Retrieved 7 January 2010. ^ "Banks redeem treasury bills woo depositors". The Zimbabwe Independent. 17 December 2009. Archived from the original on 18 March 2009. Retrieved 7 January 2010. ^ "Revised budget dashes infrastructure repair hopes". The Zimbabwe Independent. 17 December 2009. Archived from the original on 11 September 2009. Retrieved 7 January 2010. ^ "Zimbabwe abandons its currency". BBC News. 7 January 2009. Retrieved 24 August 2010. ^ "Zimbabwe Suspends Use of Own Currency". Voice of America. 12 April 2009. Archived from the original on 7 May 2009. Retrieved 7 January 2010. ^ Chinaka, Cris. "Zimbabwe dollar shelved 'for at least a year'". New Zimbabwe. Archived from the original on 7 June 2009. Retrieved 7 January 2010. ^ "Inflation hits a record high in Zimbabwe". Mail & Guardian Online. 10 March 2006. Retrieved 27 August 2008. Inflation in Zimbabwe reached its previous peak in January 2004, hitting 624%. ^ "Zimbabwean inflation hits 1,281%". BBC News. 10 January 2007. Retrieved 27 August 2008. ^ Chizhanje, Hendricks (14 July 2007). "Harare suspends release of inflation data". Zimbabwe Online – via The Zimbabwe Situation. ^ Sibanda, Tichaona (21 May 2008). "Inflation hits one million percent as prices continue to skyrocket". SW Radio Africa. Archived from the original on 26 May 2008 – via The Zimbabwe Situation. ^ "Zimbabwe annual inflation over 100,000 per cent". The Sydney Morning Herald. 21 February 2008. Archived from the original on 12 May 2008 – via The Zimbabwe Situation. ^ "Hits 355 000%". Zimbabwe Independent. 15 May 2008 – via The Zimbabwe Situation. ^ "Zimbabwe inflation spirals again". BBC News. 14 February 2008. ^ Kadzere, Martin (9 October 2008). "Inflation soars to 231 million percent". The Herald. Retrieved 7 January 2010 – via The Zimbabwe Situation. ^ "Zimbabwe Inflation Over 900 Percent". ParaPundit. 4 May 2006. ^ Meldurm, Andrew (21 February 2006). "Africa needs more courage, says Mugabe". The Guardian. ^ "Zimbabwe: Gono ordered to print Z$1 Trillion for Civil servants and Army". Zimbabwe Daily News. 28 June 2007. Archived from the original on 6 July 2007 – via The Zimbabwe Situation. ^ "Mugabe says will print more money if there isn't enough". International Herald Tribune. Associated Press. 28 July 2007. Archived from the original on 29 September 2007 – via The Zimbabwe Situation. ^ "RBZ provides $3 trillion for vote buying". The Zimbabwean. 30 August 2007. Archived from the original on 5 September 2007 – via The Zimbabwe Situation. ^ Lamb, Christina (2 March 2008). "Planeloads of cash prop up Mugabe". The Sunday Times. Archived from the original on 2 January 2010 – via The Zimbabwe Situation. ^ "Giesecke & Devrient halts deliveries to the Reserve Bank of Zimbabwe". Giesecke & Devrient GmbH, Prinzregentenstr. 1 July 2008. ^ "$100 billion for three eggs". The Herald Sun. 25 July 2008. ^ "Zimbabwe abandons its currency". BBC News. 29 January 2009. Retrieved 7 January 2010. ^ Mpofu, Bernard. "Zimbabwe to use Chinese currency". NewsDay. Retrieved 30 January 2014. ^ "Press Statement: Demonetisation of the Zimbabwe Dollar" (PDF). Reserve Bank of Zimbabwe. Archived from the original (PDF) on 11 July 2015. Retrieved 12 June 2015. ^ Reuters. "That'll be 175 quadrillion Zimbabwean dollars, please". The Daily Telegraph. Telegraph Media Group Limited. Retrieved 12 June 2015. ^ Marawanyika, Godfrey; Wallace, Paul. "175 Quadrillion Zimbabwean Dollars Are Now Worth $5". Bloomberg Business. Bloomberg L.P. Retrieved 12 June 2015. ^ "Banks pay out $7m in Zim dollar compensation". The Herald. 11 December 2015. Retrieved 9 July 2016 – via The Zimbabwe Situation. ^ Lawa, N. (3 June 2005). "Coins to replace notes". The Zimbabwean. Archived from the original on 10 June 2005. ^ Tinashe, Moyana (2010). "Exchange Rates". Mount Holyoke College. Retrieved 31 January 2018. ^ "Daily Interbank Exchange Rates Z$ per US$". Reserve Bank of Zimbabwe. 31 July 2006. Archived from the original on 1 February 2014. ^ Thornycroft, Peta (11 July 2006). "Bring on the wheelbarrows". The Daily Telegraph. ^ Gumbo, Joseph (26 July 2006). "Bills Put Zimbabwe Under "Martial Law"". Institute for War and Peace. Archived from the original on 26 June 2007 – via The Zimbabwe Situation. ^ Ndlela, Dumisani (8 September 2006). "Forex still scarce". Zimbabwe Independent. Retrieved 7 January 2010 – via The Zimbabwe Situation. ^ "ZRP steals forex from tourists". The Zimbabwean. 14 September 2006 – via The Zimbabwe Situation. ^ Ndlela, Dumisani (29 September 2006). "Zim dollar plumbs fresh depths". Zimbabwe Independent – via The Zimbabwe Situation. ^ "Black market rate continues to gallop". African News Dimension. 11 October 2006 – via The Zimbabwe Situation. ^ "Wave of price hikes dampen hopes for recovery". Zimbabwe Online. 6 November 2006. Archived from the original on 26 September 2007 – via The Zimbabwe Situation. ^ "AirZim fee fuels currency black market". Zimbabwe Standard. 19 November 2006. Archived from the original on 10 March 2010 – via The Zimbabwe Situation. ^ "Zimdollar takes heavy knock on black market". Zimbabwe Online. 29 November 2006. Archived from the original on 29 September 2007 – via The Zimbabwe Situation. ^ Mugabe, Makusha (24 December 2006). "No Rice and Chicken This Christmas". African News Dimension. Retrieved 7 January 2010 – via The Zimbabwe Situation. ^ "Dollar drops as demand soars". The Zimbabwean. 11 January 2007. Retrieved 7 January 2010 – via The Zimbabwe Situation. ^ Rukuni, Charles (18 January 2007). "Zim dollar plumbs new depths". Financial Gazette. Retrieved 7 January 2010 – via The Zimbabwe Situation. ^ "Foreign currency parallel market rates shoot up". Zimbabwe Online. 20 January 2007. Retrieved 7 January 2010 – via The Zimbabwe Situation. ^ Zulu, Blessing (22 January 2007). "Devaluation Talk Pushes Zimbabwe Dollar Down To Z$4,200 To USD". Voice of America. Retrieved 7 January 2010 – via The Zimbabwe Situation. ^ "Costs of ARVs spiral". IRIN. 25 January 2007. Retrieved 7 January 2010 – via The Zimbabwe Situation. ^ Nyakazeya, Paul (2 February 2007). "Zim dollar firms marginally". Zimbabwe Independent. Retrieved 7 January 2010 – via The Zimbabwe Situation. ^ Dzirutwe, MacDonald (11 February 2007). "Analysis: Mugabe pressure rises as Zimbabwe economic woes spread". Reuters. Retrieved 7 January 2010 – via The Zimbabwe Situation. ^ Nyakazeya, Paul (23 February 2007). "AirZim hikes fares 100%". Zimbabwe Independent. Retrieved 7 January 2010 – via The Zimbabwe Situation. ^ Murandu, Tsungai (27 February 2007). "Zimbabwe central bank to devalue dollar". Zimbabwe Online. Retrieved 7 January 2010 – via The Zimbabwe Situation. ^ Cross, Eddie (28 February 2007). "The crisis intensifies!". The Zimbabwe Situation. Retrieved 7 January 2010. ^ Shaw, Angus (1 March 2007). "Little cheer from new Z$50 000 banknote in Zim". Mail & Guardian. Retrieved 7 January 2010 – via The Zimbabwe Situation. ^ Raath, Jan (7 March 2007). "Mugabe under threat from within his collapsing state". The Times. Retrieved 7 January 2010 – via The Zimbabwe Situation. ^ Thornycroft, Peta (11 March 2007). "Inflation forces citizens into mafia economy". Independent Online. Retrieved 7 January 2010 – via The Zimbabwe Situation. ^ Ndlela, Dumisani (16 March 2007). "Dollar touches $17 500 to greenback". Zimbabwe Independent. Retrieved 7 January 2010 – via The Zimbabwe Situation. ^ Muponda, Justin (19 March 2007). "Inflation to hit 5,000 percent mark this year: IMF". Zimbabwe Online. Retrieved 7 January 2010 – via The Zimbabwe Situation. ^ "Opposition in Zimbabwe Mounts, Says U.S. Diplomat". The New York Times. 21 March 2007. Retrieved 7 January 2010 – via The Zimbabwe Situation. ^ "Mugabe fighting for political life in behind-the-scenes ruling party power struggle". International Herald Tribune. 21 March 2007. Retrieved 7 January 2010 – via The Zimbabwe Situation. ^ Zulu, Blessing (26 March 2007). "Zimbabwe Dollar In New Downward Spike Against Major Currencies". Voice of America. Retrieved 7 January 2010 – via The Zimbabwe Situation. ^ Howden, Daniel (29 March 2007). "Mugabe faces the music in Tanzania as police launch mass arrest of opponents". The Independent. Retrieved 7 January 2010 – via The Zimbabwe Situation. ^ Bloch, Eric (1 April 2007). "Zimbabwe business committing hara-kiri". Zimbabwe Independent. Retrieved 7 January 2010 – via The Zimbabwe Situation. ^ "Fuel Prices Tumble". The Herald. 6 April 2007. Retrieved 7 January 2010 – via The Zimbabwe Situation. ^ Shaw, Angus (7 April 2007). "Black Market Economy Thrives in Zimbabwe". Associated Press. Retrieved 7 January 2010 – via The Zimbabwe Situation. ^ "Across the border for sugar". IRIN. 10 April 2007. Retrieved 7 January 2010 – via The Zimbabwe Situation. ^ "Zimdollar drop: speculators blamed". Zimbabwe Standard. 15 April 2007. Retrieved 7 January 2010 – via The Zimbabwe Situation. ^ Seria, Nasreen; Mutizwa, Godfrey (26 April 2007). "Zimbabwe Devalues Currency by 98% to Boost Exports". Bloomberg News. Retrieved 7 January 2010 – via The Zimbabwe Situation. ^ "Golden leaf fails to boost forex earnings". The Zimbabwean. 10 May 2007. Retrieved 7 January 2010 – via The Zimbabwe Situation. ^ Schrank, Peter (17 May 2007). "Back to the dark ages". The Economist. Retrieved 7 January 2010 – via The Zimbabwe Situation. ^ Dube, Pindai; Ndlovu, Nqobani (20 May 2007). "Zimbabwe dollar in for a hard time". Zimbabwe Standard. Retrieved 7 January 2010 – via The Zimbabwe Situation. ^ Games, Dianna (21 May 2007). "How life goes on for the super rich of Zimbabwe". Business Day. Retrieved 7 January 2010 – via The Zimbabwe Situation. ^ "Police ban march". Financial Gazette. 24 May 2007. Retrieved 7 January 2010 – via The Zimbabwe Situation. ^ "As services collapse, corruption flourishes". IRIN. 28 May 2007. Retrieved 7 January 2010 – via The Zimbabwe Situation. ^ "Zimbabwe targets 25 pct mth/mth inflation by year-end". Reuters. 2 June 2007. Retrieved 7 January 2010 – via The Zimbabwe Situation. ^ "Children left at home pay the price of migration". IRIN. 11 June 2007. Retrieved 7 January 2010 – via The Zimbabwe Situation. ^ "Mugabe should resign". The Zimbabwean. 12 June 2007. Retrieved 7 January 2010 – via The Zimbabwe Situation. ^ Gonda, Violet (19 June 2007). "Will the economic collapse be the end of Mugabe?". SW Radio Africa. Retrieved 7 January 2010 – via The Zimbabwe Situation. ^ "Zimbabwe currency crashes; inflation as high as 9,000%". CNN. 21 June 2007. Retrieved 7 January 2010 – via The Zimbabwe Situation. ^ Karimakwenda, Tererai (22 June 2007). "Zimbabwe dollars rejected as currency crashes". SW Radio Africa. Retrieved 7 January 2010 – via The Zimbabwe Situation. ^ Wines, Michael (4 July 2007). "Zimbabwe in disarray over inflation fight". International Herald Tribune. Retrieved 7 January 2010 – via The Zimbabwe Situation. ^ Reynolds, Neil (13 July 2007). "A letter of despair from Zimbabwe". The Globe and Mail. Retrieved 7 January 2010 – via The Zimbabwe Situation. ^ "Water shortages spur sharp rise in diarrhea, dysentery in Zimbabwe". International Herald Tribune. 20 August 2007. Retrieved 7 January 2010 – via The Zimbabwe Situation. ^ a b "Zimbabwe devalues currency to 30,000/dlr". Reuters. 6 September 2007. Retrieved 7 January 2010 – via The Zimbabwe Situation. ^ Nyakazeya, Paul (14 September 2007). "Zim dollar weakens". Zimbabwe Independent. Retrieved 7 January 2010 – via The Zimbabwe Situation. ^ "Not Enough Money to Feed the Hungry". UN Integrated Regional Information Networks. 17 September 2007. Retrieved 7 January 2010 – via The Zimbabwe Situation. ^ Zulu, Blessing (25 September 2007). "Zimbabwe Food, Transport Prices Soar While Local Currency Tumbles". Voice of America. Retrieved 7 January 2010 – via The Zimbabwe Situation. ^ Johnson, Scott (28 September 2007). "Decaying Nation". Newsweek. Retrieved 7 January 2010 – via The Zimbabwe Situation. ^ Mpofu, Patricia (17 October 2007). "Zim opposition wants police prosecuted for torture". Zimbabwe Online. Retrieved 7 January 2010 – via The Zimbabwe Situation. ^ "1 U.S. dollar buys 1 million Zimbabwe dollars on black market". International Herald Tribune. 18 October 2007. Retrieved 7 January 2010 – via The Zimbabwe Situation. ^ Cross, Eddie (31 October 2007). "Mugabenomics". Mens News Daily. Retrieved 7 January 2010 – via The Zimbabwe Situation. ^ "Zim: War heroes & plenty zeros". Fin24. 13 November 2007. Retrieved 7 January 2010 – via The Zimbabwe Situation. ^ "Of cash and dealers". IRIN. 23 November 2007. Retrieved 7 January 2010 – via The Zimbabwe Situation. ^ Makamure, Lucia (30 November 2007). "Asylum-seekers face deportation from UK". Zimbabwe Independent. Retrieved 7 January 2010 – via The Zimbabwe Situation. ^ Muronzi, Chris (30 November 2007). "Cash for sale in Zim". Fin24. Retrieved 7 January 2010 – via The Zimbabwe Situation. ^ Zulu, Blessing (3 December 2007). "Zimbabwe Dollar Crashes On Central Bank Plan To Issue New Notes". Voice of America. Retrieved 7 January 2010 – via The Zimbabwe Situation. ^ Rusere, Patience (3 January 2008). "Cash-Poor Zimbabweans Turn To Parallel Market To Procure Bank Notes". Voice of America. Retrieved 7 January 2010 – via The Zimbabwe Situation. ^ "Money for nothing". IRIN. 4 January 2008. Retrieved 7 January 2010 – via The Zimbabwe Situation. ^ "Zim dollar takes another dive". The Zimbabwean. 8 January 2008. Retrieved 7 January 2010 – via The Zimbabwe Situation. ^ a b Mulozo, Calvin (28 February 2008). "Zimbabwe Dollar Takes Heavy Knock". The Zimbabwe Gazette Daily News Online. Archived from the original on 29 February 2008. Retrieved 9 July 2016. ^ Kandemiiri, Jonga (24 January 2008). "Zimbabwe Cash Crisis Eases But Local Currency Value Heads South". Voice of America. Retrieved 7 January 2010 – via The Zimbabwe Situation. ^ "Old Mutual Implied Rates (OMIR) as at 25 January 2008" (PDF). Bulls & Bears. Archived from the original (PDF) on 9 September 2008. Retrieved 22 August 2008. ^ "Zimbabwe's inflation woes continue". Independent Online. 12 February 2008. Retrieved 7 January 2010 – via The Zimbabwe Situation. ^ a b Kaseke, Edith (21 February 2008). "Dollar tumbles again, as one US unit trades at Z$20 million". Zimbabwe Online. Retrieved 7 January 2010 – via The Zimbabwe Situation. ^ Lamb, Christina (2 March 2008). "Planeloads of cash prop up Mugabe". The Sunday Times. Archived from the original on 2 January 2010. Retrieved 7 January 2010 – via The Zimbabwe Situation. ^ "Zimbabwe currency tumbles to record 25 million Zimbabwe dollars for one American dollar". International Herald Tribune. 5 March 2008. Retrieved 7 January 2010 – via The Zimbabwe Situation. ^ Sokwanele (10 March 2008). "Zimbabwe Business Watch : Week 11". The Zimbabwe Situation. Retrieved 7 January 2010. ^ "More cash makes food expensive". IRIN. 18 March 2008. Retrieved 7 January 2010 – via The Zimbabwe Situation. ^ "Cash shortage to ease, for now". The Zimbabwe Gazette Daily News Online. Archived from the original on 8 December 2008. Retrieved 25 June 2008. ^ Mafaro, Wayne; Khumalo, Nqobizitha (17 April 2008). "No let up in Zim crackdown on reporters". Zimbabwe Online. Retrieved 7 January 2010 – via The Zimbabwe Situation. ^ Rukuni, Charles (24 April 2008). "ZITF shows stark contrast in Zim". Financial Gazette. Retrieved 7 January 2010 – via The Zimbabwe Situation. ^ Thornycroft, Peta (25 April 2008). "Cry, Another Beloved Country". Newsweek. Retrieved 7 January 2010 – via The Zimbabwe Situation. ^ a b c d "Foreign Currency Auction System". Reserve Bank of Zimbabwe. Archived from the original on 25 March 2008. ^ Dzirutwe, MacDonald (30 April 2008). "Zimbabwe commercial bank eases foreign exchange rules". Reuters. Retrieved 7 January 2010 – via The Zimbabwe Situation. ^ "Zimbabwe's currency gets more threadbare". Business Report. 6 May 2008. Retrieved 7 January 2010 – via The Zimbabwe Situation. ^ Tinona, Peter (13 May 2008). "The Reserve Bank of Zimbabwe caves in to black market pressure". The Zimbabwean. Retrieved 7 January 2010 – via The Zimbabwe Situation. ^ Sokwanele (15 May 2008). "Zimbabwe Business Watch : Week 20". The Zimbabwe Situation. Retrieved 7 January 2010. ^ a b c d e f g h i j k l m n o "Send money to friends and family in Zimbabwe". Siyabonga-tatenda.com. Archived from the original on 5 July 2008. Retrieved 23 July 2015. ^ "Zim Dollar Crashes". Zimbabwe Independent. 5 June 2008. Retrieved 9 July 2016 – via The Zimbabwe Situation. ^ "OMIR (US$)". Zimbabwean Equities.com. Archived from the original on 20 August 2008. Retrieved 23 July 2015. ^ a b c d e f g h "Redirect to swradioafrica podcasts (1)". SW Radio Africa. Retrieved 23 July 2015. ^ a b "Redirect to swradioafrica podcasts (2)". SW Radio Africa. Retrieved 23 July 2015. ^ a b c "OMIR (US$)". Zimbabwean Equities. Retrieved 23 July 2015. ^ "World Currencies: Europe/Africa/Middle East". Bloomberg L.P.
^ "FXConverter – Currency Converter for 164 Currencies". Oanda Corporation. Archived from the original on 2 May 2009. ^ Dzirutwe, MacDonald (30 July 2008). "Zimbabwe redenominates currency to ease crisis". Reuters. Archived from the original on 25 December 2008. ^ "Zimbabwe: RBZ Suspends RTGS Payment System". Zimbabwe Independent. 2 October 2008. ^ Gonda, Violet (13 November 2008). "Reserve bank reinstates electronic transfers". SW Radio Africa. Archived from the original on 30 December 2008. ^ a b "Is this the end of Zimbabwe's $1000 loaf of bread?". Financial Times. 12 September 2008. Retrieved 7 January 2010 – via The Zimbabwe Situation. ^ "Zimbabwe licenses shops to accept foreign currency". Reuters. 25 September 2008. Retrieved 7 January 2010 – via The Zimbabwe Situation. ^ Latham, Brian (30 September 2008). "Zimbabwe Tobacco Season Officially Ends; Deliveries Down 40%". Bloomberg. Retrieved 7 January 2010 – via The Zimbabwe Situation. ^ Sebata, Lizwe; Kaseke, Edith (3 October 2008). "Political impasse sends Zimbabwe dollar tumbling". Zimbabwe Online. Retrieved 7 January 2010 – via The Zimbabwe Situation. ^ "50,000-dollar banknote for inflation-wracked Zimbabwe". AFP. 11 October 2008. Retrieved 7 January 2010 – via The Zimbabwe Situation. ^ "Zimbabwe power-sharing talks collapse". Monsters and Critics. 17 October 2008. Retrieved 7 January 2010 – via The Zimbabwe Situation. ^ "Zimbabwe stock market up 257 percent in a day". CNN. 22 October 2008. Retrieved 7 January 2010 – via The Zimbabwe Situation. ^ Okon-Ekong, Nseobong (20 October 2008). "Zimbabwe's Economic Crisis Worsens". Thisday. Retrieved 7 January 2010 – via The Zimbabwe Situation. ^ Sibanda, Sibangani (24 October 2008). "Why was Zimbabwe invited to Kampala?". Zimbabwe Times. Retrieved 7 January 2010 – via The Zimbabwe Situation. ^ Rusere, Patience (29 October 2008). "Zimbabwe Central Banker Reports 'Concerted Efforts' For Turnaround". Voice of America. Retrieved 7 January 2010 – via The Zimbabwe Situation. ^ "The grey economy is the real one". IRIN. 4 November 2008. Retrieved 7 January 2010 – via The Zimbabwe Situation. ^ Kandemiiri, Jonga (12 November 2008). "Zimbabwe Prices In Stratosphere As Political Power-Sharing Falters". Voice of America. Archived from the original on 13 November 2008. Retrieved 7 January 2010. ^ Gonda, Violet (13 November 2008). "Reserve bank reinstates electronic transfers". SW Radio Africa. Archived from the original on 30 December 2008. Retrieved 7 January 2010. ^ "RTGS Not Functional". Radiovop. 26 November 2008. Archived from the original on 23 December 2008. Retrieved 7 January 2010. ^ Site notice, Zimbabwean Equities, 19 November 2008. ^ "New Zimbabwe bank limits trigger surge in prices". Agence de Presse Africaine. 4 December 2008. Retrieved 7 January 2010 – via The Zimbabwe Situation. ^ "Zimbabwe introduces $500 million note". CNN. 12 December 2008. Retrieved 7 January 2010. ^ "Online". The Chronicle. Archived from the original on 25 January 2009. Retrieved 7 January 2010. ^ "Cost of 3 papers in Zimbabwe: 1 $50 billion note". Fox News. 12 January 2009. ^ "Zimbabwe to launch 100 trillion dollar note: report". Reuters. 16 January 2009. Retrieved 7 January 2010. ^ Raath, Jan (23 January 2009). "Unintended effect of Zimbabwe dollarization - no change!". Monsters and Critics. Retrieved 7 January 2010 – via The Zimbabwe Situation. ^ Maingire, Raymond (22 January 2009). "Teachers demand US$2200 minimum". Zimbabwe Times. Retrieved 7 January 2010 – via The Zimbabwe Situation. ^ "Harare teacher: 'I can't afford to work'". BBC News. 26 January 2009. Retrieved 7 January 2010 – via The Zimbabwe Situation. ^ "Budget likely to show Mugabe's desperation". Reuters. 28 January 2009. Retrieved 7 January 2010. ^ "Zimbabwe Teachers Can't Afford to Report for Work". Bloomberg. 29 January 2009. Archived from the original on 27 March 2010. Retrieved 7 January 2010. ^ a b "The United Nations Operational Rates of Exchange". United Nations. Archived from the original on 13 September 2009. Retrieved 7 January 2010. ^ "Zim trims 12 zeroes from trillion dollar note". Commodity Online.com. 2 February 2009. Retrieved 7 January 2010. ^ "Cash for Zimdollar notes, says RBZ". The Herald. Zimbabwe Newspapers (1980) Ltd. Retrieved 12 June 2015.